If you are in London on the 1st of March come and join us at the Thursday Club, Goldsmiths College. 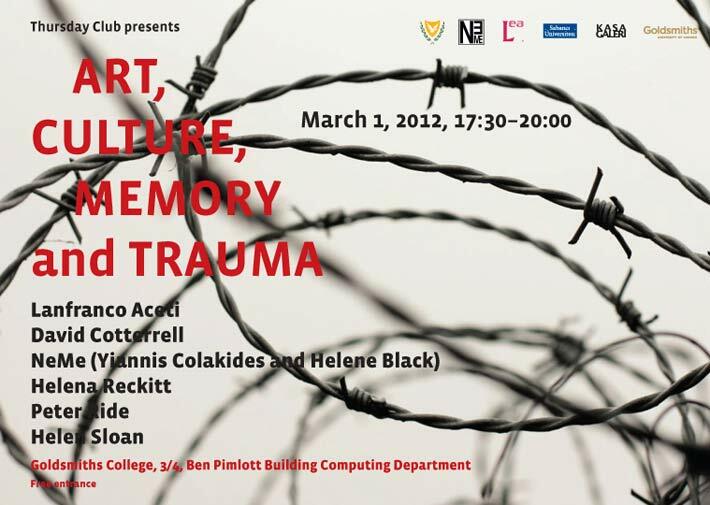 The symposium Art, Culture, Memory and Trauma will take place Thursday, March 1, 2012 at Goldsmiths, University of London as part of the Thursday Club. The symposium is part of the art initiative Through the Roadblocks, by NeMe. The event is hosted by Prof. Janis Jefferies, Goldsmiths College and is organized in collaboration with Prof. Lanfranco Aceti, Sabanci University, Peter Ride, University of Westminster and NeMe (Helene Black and Yiannis Colakides), Cyprus. Art, Culture, Memory and Trauma will focus on the analysis of current curatorial and artistic practices that analyse and formalize aesthetic approaches to the traumatic inheritance of social and political conflictual events and to the processes of memorialization and aesthetization. In particular by taking as starting point the legacy of Cyprus’ conflict and the war in Afghanistan, the symposium will analyse questions related to Body Politics (Nicholas Mirzoeff), diaspora and memorialization. The questions will focus on curatorial and artistic practices as well as on the difficulties of overcoming borders and national cultural boundaries in order to develop artistic engagements and curatorial projects. Time: March 1, 2012, 17:30 – 20:00. Lanfranco Aceti works as an academic, artist and curator. He is Visiting Professor at Goldsmiths College, department of Art and Computing, London; teaches Contemporary Art and Digital Culture at the Faculty of Arts and Social Sciences, Sabanci University, Istanbul; and is Editor in Chief of the Leonardo Electronic Almanac (Leonardo/ISAST, MIT Press). Currently he is the Director of Kasa Gallery in Istanbul and was the Artistic Director and Conference Chair for ISEA2011 Istanbul. David is Professor of Fine Art at Sheffield Hallam University. NeMe – Yiannis Colakides and Helene Black are the founders of NeMe a non profit, Cyprus registered cultural NGO. NeMe works on two platforms – a virtual and an itinerant one – and focuses on contemporary theories and their intersection with the arts. NeMe’s itinerant platform, the IMCA (Independent Museum of Contemporary Art) presents NeMe projects which include, exhibitions, publications, performances, new media events, lectures, workshops and archives. The form of the IMCA is determined as a practice or process by the nature of each project with the notion of the exhibition “space” being constantly revised and redefined. Helena Reckitt is an independent curator and critic and Senior Lecturer in Curating at Goldsmiths College, University of London. She has previously held curatorial and programming posts at the Power Plant, Toronto, the Atlanta Contemporary Art Center, Georgia, and the ICA, London, and was a commissioning editor in film and performance studies at Routledge. Reckitt is editor of Art and Feminism (Phaidon Press, 2001), a sourcebook which has been reissued numerous times and translated into several languages. Currently she is curating one zone for Nuit Blanche, Toronto, 2012, with works by artists including the Trisha Brown Dance Company, Oliver Husain, and Katie Patterson, and organising a solo show for Oakville Galleries, Ontario, with the artist Keren Cytter. Peter Ride is Principal Research Fellow in Visual Culture. Through commissioning and producing new work, he is addressing the way that artists can use digital technology and develop new forms and systems that enable them to create innovative work. Peter is also the Artistic Director of DA2, Digital Arts Development Agency, an organisation that develops commissions, artist residencies and curatorial training schemes. Peter is also the Artistic Director of DA2, Digital Arts Development Agency, an organisation that develops commissions, artist residencies and curatorial training schemes. This role provides the focus for his research activity at Westminster through action research involving new projects. Previously he was the Arts Programme co-ordinator for Artec, the Arts Technology Centre, London (1995-7), and Director of the Cambridge Darkroom Gallery (1992-5). He was educated at the Australian National University. Helen Sloan has worked as a curator, researcher, writer, editor and producer in media arts and culture since late 1980s. Since 2003, she has been Director of SCAN, a networked organisation and creative development agency for media arts in the South of England working on media arts projects and strategic initiatives in arts organisations, academic institutions and further aspects of the public realm. Helen has worked both freelance and as a curator at organisations such as Camerawork, FACT, ICA and Site Gallery as well as directing festivals such as Across Two Cultures in Newcastle 1996 (an early conference on the overlapping practice of creative thinking in arts and science) and Metapod, Birmingham 2001 – 2. Current areas of interest and curatorial work include the points of intersection of science and culture, immersive environments, media arts and the creative economy, nanotechnology, and wearable and soft technologies.